If you follow happenings in and around the beer industry, you likely know the Craft Brew Alliance recently laid off about half of the production staff at its Woodinville brewery. It's an unfortunate development, but also related to the CBA's evolution. Earlier this year, the CBA entered into a contract brewing arrangement with Pabst at the old Redhook brewery. 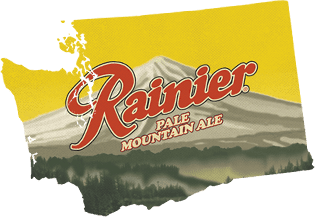 Pabst, which planned to brew Rainier Pale Mountain Ale and some other brands in Woodinville, has an option to purchase the brewery within three years. Back up a bit. The need to lease the brewery was activated for good reason. First, expansion (to 750,000 barrels/year) and modernization of the Portland facility means more CBA brands will be brewed there. Second, an expanded deal with Anheuser-Busch means some CBA beers, up to 300,000 barrels a year, will be brewed at AB factory breweries. The plan was for Pabst to soak up production capacity as the CBA shifted its own production to Portland and elsewhere. The Woodinville brewery, somewhat antiquated with a capacity of about 250,000 barrels a year, continues to produce a few CBA brands, including all Redhook and Widmer 22 oz bombers. But those numbers are declining. And Pabst has failed to fill the capacity vacated by departing CBA brands. Reports say the brewery was running at 30 percent of capacity. That's what forced the layoffs. This was obviously not a desired outcome for the CBA, which hoped Pabst would do well and eventually purchase the old brewery. It's stock price has dipped slightly in recent weeks in response. Inquiring minds may wonder why Pabst, which owns a number of "heritage" brands, has failed to use more of the available production capacity in Woodinville. The answer is simple. Except for Mountain Ale and Not Your Daddy's Root Beer, most Pabst brands are brewed at MillerCoors plants. That's apparently something Pabst can't or won't change in the near term. Mountain Ale, released last spring, is based on a pre-prohibition ale. It's darker than you might expect, but a serviceable beer that's roughly on par with lower end craft brands. If Mountain Ale isn't moving as Pabst hoped, perhaps they should consider the price...currently $11.99 (on sale) at my local Fred Meyer. That's for a six-pack of 16 oz bottles. Neither the 16 oz bottles nor the price make sense to me, but never mind. For its part, the CBA brass, shareholders and Woodinville employees are hoping things turn around for Pabst. Because if Pabst doesn't morph into an eligible buyer, the CBA has limited options with a property whose size and efficiency are problematic. The most likely scenario if nothing changes is closure, in which case the jobs and investment there will simply be lost. This chain of events was set in motion by consolidation. The CBA initiated the arrangement with Pabst in anticipation of an impending deal with Anheuser-Busch, as well as its own expansion. The big idea is consolidation of CBA production in larger, more efficient breweries. Once that happened, the Woodinville brewery was expendable and subject to closure or sale. Give the CBA credit. They took a flyer on Pabst, hoping (perhaps praying) things would work out and that the brewery would eventually be purchased and the jobs there transitioned to Pabst. They almost certainly knew or should have known that the chances of that happening were sketchy. But there was at least a chance. This is how consolidation works, folks. When brewers get so large that they move production to huge, largely automated factory breweries, jobs at smaller, less efficient facilities are lost. What's happening at Woodinville is Consolidation 101. Great analysis, Pete, except the I don't know Redhook's plant really qualifies as a "smaller, less-efficient facility." But that's a quibble--great work. That's the way it's been described by CBA brass in the industry newsletters. That brewery certainly isn't small by local craft standards, but it looks pretty puny next to the modernized and enlarged Portland brewery. If I had to guess, I'd say efficiency is probably the larger issue. But that would be guessing. I only drink Select beers. Like Bud Select. Just wish the mtns would turn blue...damn you Curs! This Bud's for you, my friend.